The teams at the Novotel Paris East and I are pleased to welcome you to our warm, friendly hotel for a business trip or family getaway. We will do our utmost to ensure you have a pleasant stay. 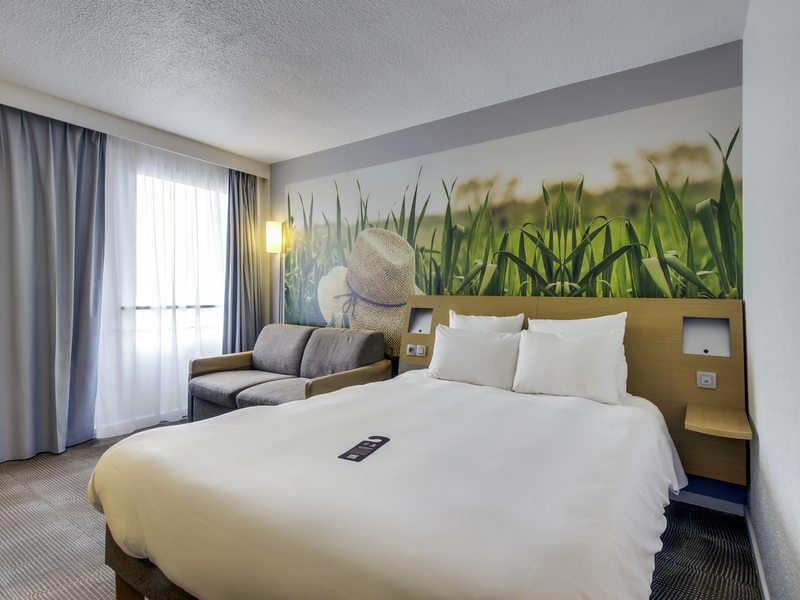 Whether on a business trip or family getaway, come and relax at the Novotel Paris East hotel. Our restaurant and bars welcome you around the clock for meals or light bites. The hotel is the ideal place for successful events thanks to its 33 rooms and conference hall for 600 people. Our spacious rooms are perfect for unwinding after a long day of work or sightseeing. An Escape Game, fitness center and hammam are also available to brighten up your day. With their contemporary and completely modular design, Novotel's spacious rooms are true living areas and can be adapted to suit all requirements. Our 269 sq. ft (25 m²) rooms and are designed for your comfort, with quality bedding, air conditioning, flat-screen TV, safe, room service and bathroom with bathtub or shower. Rooms can accommodate up to 4 people and are ideal for families. Our chef at the Novotel Café invites you to discover his traditional cuisine with a modern touch. Enjoy your meals and breakfast in contemporary and bright surroundings. L'Instant Nomade offers tasty and balanced food in a unique, friendly and cosmopolitan atmosphere 24 hours a day. For something sweet or savory, or a cold drink, it offers the convenience of self-service at any time of day or night. Ideal for a break, relaxing after a meal, an evening out, with friends or for professional meetings. Discover the relaxed ambiance of the bar lounge and enjoy our aperitifs and cocktails. 호텔 룸마다 창문이 열리지 않는다. 그리고 단체 손님들이 와서 밤새도록 행사를 해서 무척 시끄러웠다. 아침식사도 생각했던 것보다 만족스럽지 못했다. 왜냐하면 단체손님들이 와서 음식이 금새 부족했다. 그리고 무엇보다 체크아웃 시에 프런트에 있는 직원의 실수로 인해서 아침식사가 추가되어 비용이 계산되었다. 이를 후에 확인하고 난 뒤에 호텔에 전화를 했는데 참으로 불친절하게 전화를 받아 당황스러웠다. Dear Young Ju k., Thank you very much for having taken the time and trouble to share your impressions with us following your recent stay at the Hotel Novotel Paris Est. We greatly appreciate any comments made by our guests and constantly strive to achieve the highest quality standards.We will be sure to share your comments regarding the rooms types that you booked and ensure that the necessary measures will be applied to avoid any future dissatisfaction. Hopefully we have the pleasure to welcome you back soon and please do not hesitate to look on our Website for special offers. Yours sincerely, Aïssata Guest Relation. 대중교통편의성과 객실수준은 만족! 잘안열리는 문은 불만! 호텔 내외부가 매우 깨끗하고 직원들이 친절하였다. 고객의 요청사항에 대해 성실히 답해주었습니다. 리셉션 데스크(일부) 커뮤니케이션 불친절 및 업무 미숙 / 여성 리셉션니스트 불친절 / 특히 중국 단체 관광객만 우선 순위 응대. 호텔 건물은 오래된거 같았습니다. 침실은 괜찮았습니다. 다양한 인종들이 사용하므로 룸안에 방향제가 있었으면 좋겠습니다. 직원들은 대체적으로 친절하셨습니다. 아침 식사 메뉴는 좋았지만, 메뉴가 조금 더 있었으면 좋겠습니다.